I was off work for 11 days over the holidays... the longest stretch of not sitting at a desk since hiking the JMT in 2010. Since I was spending 10 of those 11 days in Arizona, I intended to take full advantage of the perfect weather and get in a microcycle of really solid training - quality workouts and higher mileage. 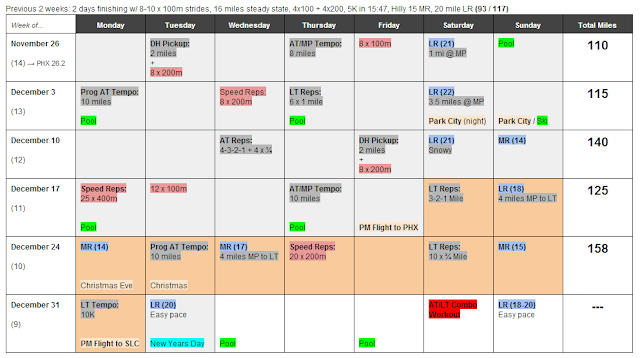 Over the first 3 weeks of December I started to phase in a variety of tempo runs (8-10 miles, both progressive and steady), along with some interval workouts (25 x 400m, 6 x Mile... the basics), and several 20+ mile long runs. The goal during those weeks was to prepare myself to be ready to handle a much more intense period over the holidays. Here is my complete December Training Log. AM - 16 miles. 10 Mile AT Progressive Tempo in 53:06 (5:19/mi avg). Splits - 5:33, 5:26, 5:25, 5:21, 5:20, 5:19, 5:17, 5:13, 5:10, 5:02. AM - 15 miles. 10K LT Tempo in 30:52 (4:58/mi avg). Splits - 5:00, 5:02, 5:04, 4:58, 4:55, 4:55, 0:58. Now, that's a lot more mileage (253 miles in 11 days) and intensity than I usually put into such a short time frame. But, I didn't have anything else going on - I was sleeping / resting a lot, running on soft surfaces as much as possible, etc. I ran by feel (as always) and my body responded well. I'll post more on this topic - how I build training plans - in a future post. How have you trained your body to recover and bounce back so quickly from each session? So that's the question I'll address first in my next blog post... at first I wasn't sure of my response because I don't do anything "special"... but then I started jotting some notes on my iPad while flying back to SLC, and before you knew it, I had a pretty good list of things I do to recover quickly... I just don't think of them because they've become automatic for me. Man, that's a solid block of training. Once you start getting adapted to that type of stress, you'll really be flying. Keep it up! I am excited to read these upcoming posts.